I know many people like extra drives as me, such as external hard drive, USB flash drive, and online storage service, we never think that enough. My laptop's hard drive is 160GB, I have another 160GB of external hard drive, and several GBs of flash drive, but I still think that is not enough for store some big media files. Online storage service is my choice too. I have several big online storage accounts, such as Divshare, Adrive, Xdrive. I know maybe I will never fill these spaces I still want more. Strange, is it? 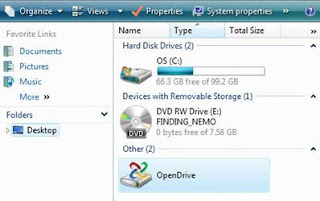 Open Drive is a new online storage that allows you store your files as other online storage services, but it has a handy function that has a desktop client, you can easy to upload your file into your online drive. After you install that client it will add a drive on your computer, that is a remote drive, so it runs easy as local drive. I have an account of Boxstr, so I can use that ID to sign in with Open Drive. Both sites are belong to same company, but they offer different size of space, Boxstr offers free user 5GB while Open Drive only 1GB. I suggest sign up with Boxstr, and use that ID to use Open Drive client.